Under-23 Men - Jack Rowe (Aldershot, Farnham & District AC) 31ST. 3RD TEAM. Senior Women - Emelia Gorecka (Aldershot, Farnham & District AC) 8TH & Lily Partridge (Aldershot, Farnham & District AC) 15TH. 1ST TEAM. Under-20 Women - Niamh Brown (Aldershot, Farnham & District AC) 12TH. 1ST TEAM. Under-23 Women - Phoebe Law (Kingston AC & Polytechnic Harriers) 10TH. 1ST TEAM. SURREY U13/U15 SPORTSHALL, SPECTRUM, GUILDFORD, 26TH NOVEMBER 2017 - RESULTS. Surrey County AA’s Development and Coaching committee has reviewed the role of Jake Waldron, our newly appointed Athletics Development Officer, and decided to discontinue the appointment after the six month trial period. On the County’s behalf we would like to thank Jake for his efforts during his six months in post. Your County Association is still determined to address the issues that prompted us to appoint an Athletics Development Officer earlier this year - the shortage of Surrey athletes in technical events including throws, jumps, steeplechase and hurdles. However we now aim to deliver our objectives by appointing qualified individuals to run focused projects to deliver our objectives. The first of these will be a throws workshop at the David Weir Leisure Centre on December 3rd which will be overseen by Camilla Thrush. SCHOOLS INTERNATIONAL INDOOR COMBINED EVENTS, GLASGOW, 10TH/11TH NOVEMBER 2017 - We congratulate Pippa Earley (Kingston AC & Polytechnic H) on her victory in the Under-18 Pentathlon. Her score of 3901pts was gained through the following performances: 800m - 2.14.41sec, HJ 1.50m, LJ 5.61m, shot 11.99m, 60 hurdles 8.64. The England team also won a gold medal. BRUCE JUDD (SURREY COUNTY) CROSS-COUNTRY RELAY CHAMPIONSHIPS, STOKE PARK, GUILDFORD, 28TH OCTOBER 2017 - RESULTS (47k xlsx). Please note that the Under-15 Boys result has been amended. Times for legs 2 & 3 have been corrected. There are no changes to the team placings. SURREY U13/U15 SPORTSHALL, SPECTRUM, GUILDFORD, 15TH OCTOBER 2017 - RESULTS. The next meeting is on 26th November 2017. We are also pleased to note that the Chef de Mission for the England Team is Sarah Winckless a member of Epsom & Ewell Harriers and a former Surrey Discus champion. SURREY COUNTY MASTERS CROSS-COUNTRY CHAMPIONSHIPS, RICHMOND PARK, 21ST OCTOBER 2017 - M40 & M50 RESULTS WOMEN & M60 RESULTS. SURREY TRACK & FIELD RANKINGS FOR 2017 - Our compilers are coming to the end of their six month stint of keeping thr ranking lists up to date. If you have any further amendments then please submit them before the end of October. Meanwhile we have produced the Annual Statistical Analysis of U13 / U15 / U17 Track & Field Performances for 2017 based upon performances received by 11th October 2017. This will be updated at the end of the month. DEVELOPMENT NEWS - Our ADO, Jake Waldron, has created a document outlining all of the financial grant support available for talented developing junior athletes, to support talented Surrey junior athletes to get the best financial support possible for them to reach their athletic potential. Congratulations to Pippa Earley (Kingston AC & Polytechnic H) on her SILVER MEDAL in the Intermediate Girls Heptathlon. Her score of 5123 points was better than the existing Surrey record of 4861 points but the average wind speed reading across the Hurdles / 200 metres / Long Jump exceeded 2 metres/second and, therefore, is considered to be a wind-assisted performance for record purposes. However, Pippa had another long jump of 5.56m with a wind speed reading of 2.0m/s which gives an average reading of less than 2.0m/s. Using the 5.56m jump gives a points total of 5102 points which is a new Surrey Under-17 record beating the previous record of 4861 points set by Clover Wynter-Pink (Croydon H) in 1994. Surrey medal winners. Surrey Under-17 Women Records. SEAA U20/U15 INTER-COUNTY TRACK & FIELD, OXFORD, 9TH SEPTEMBER 2017 - Tom Pollak, chairman of Surrey County AA, wishes to apologise for the fact that Surrey only had one under-15 athlete at the South of England inter-counties meeting at Oxford on Saturday. This was due to the fact that the person appointed to choose the teams and manage them on the day, at a very late stage, for personal reasons, was forced to withdraw. It is most unfortunate that about 30 young athletes were deprived of the opportunity to gain a county vest. However, this throws up the continuing problem the county has of finding people to manage our teams. The athletes making up the teams come from our clubs as do the team managers. I need to appeal to all clubs in the county to look among your senior members to find people to act as county track and field team managers to stop what happened at the weekend reoccurring. If you have any suitable candidates to carry out this role could they please contact Surrey's track and field teams coordinator Paul Eales at paul.eales@hotmail.co.uk. SURREY COUNTY ROAD RELAY CHAMPIONSHIPS, WIMBLEDON PARK, 2ND SEPTEMBER 2017 - RESULTS (435k xlsx). SLH photos (includes runners from other clubs). Congratulations to Jaleel Roper (Hercules Wimbledon AC) who set a new SURREY RECORD and equalled the existing UK RECORD for the Under-15 Boy's 200m when he won the Final on Sunday with a time of 22.13/+1.3. The previous Surrey record of 22.55 was set by Robert Hunt (Woking AC) in 2005. Tyler Panton (Walton AC) who finished third in 22.47/+1.3 also broke the previous record. Both Jaleel and Tyler achieved the same finishing positions in the final of the 100m held on Saturday. George Hopkins (Woking AC) was another double champion following his victories in the Under-15 Boys Pole Vault & Javelin. Pippa Earley (Kingston AC & Polytechnic H) also set a new SURREY RECORD and set a new UK RECORD for the Under-17 Women's 80m Hurdles with her winning time in the final of 10.97/+0.1. This beat the previous Surrey record of 11.07/+0.2 set by Marcia Sey (Croydon H) when she won this year's English Schools title. Surrey medal winners. Surrey Under-15 Boys Records. Surrey Under-17 Women Records. Women 800m - Adelle Tracey (Guildford & Godalming AC); Men 100m - Sam Osewa (Croydon H) & Men 400m Hurdles - Jacob Paul (Windsor, Slough, Eton & Hounslow AC). SURREY ROAD LEAGUE 2017 - The results of the Wimbledon Dash 5k held on 13th August have been included. This concludes the 2017 series of races. Team & Individual scores. 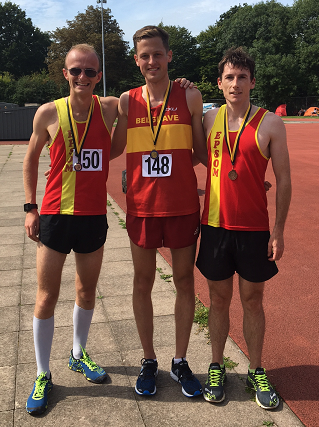 SURREY 5K ROAD CHAMPIONSHIPS, WIMBLEDON, 13TH AUGUST 2017 - RESULTS. DEVELOPMENT NEWS - Our ADO, Jake Waldron, is planning to support the Herne Hill Harriers throw festival on September 23rd at Tooting Bec Athletics Track – DETAILS. He is speaking to a few potential deliverers with regards to hosting a Throws workshop the following day at Tooting Bec Track for Surrey Clubs to attend. He is hoping to deliver a similar throws festival and workshop in South Surrey. 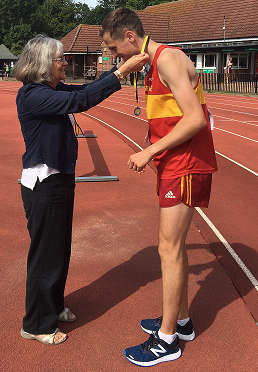 Congratulations to George Asprey (Aldershot, Farnham & District AC) on his third place in the U15B Octathlon with a score of 3822 points. Surrey medal winners. You never know what officials are called on to do. 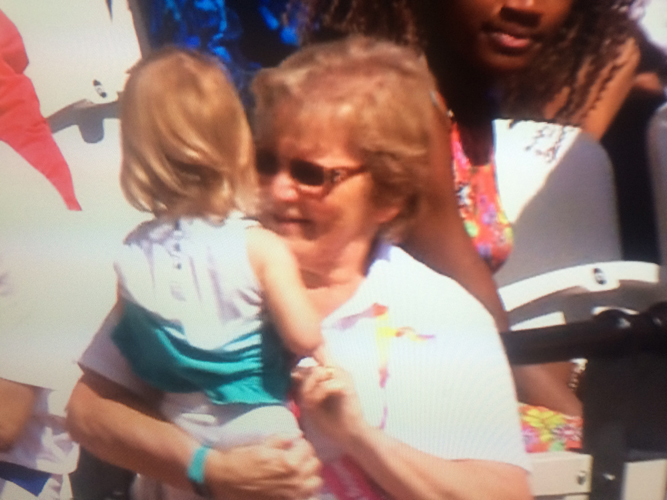 Here Surrey assistant secretary and past president Margaret Nelson steps in to act as porter carrying Robbie Grabarz's daughter to the high jumper after he'd qualified for the World championships final at the London Stadium on Friday afternoon. Di Norman (Epsom & Ewell) W40 Heptathlon GOLD MEDAL 5642pts (just 200 points off World Record). Mark Roberts (Kingston AC & Polytechnic H) M45 Decathlon BRONZE MEDAL. CAU INTER-COUNTY TRACK & FIELD CHAMPIONSHIPS, BEDFORD, 29TH/30TH JULY 2017 - Performances by Surrey athletes. U13 Inter-Counties Meeting website (for previous results). SURREY SAYS NO TO CHANGING ELIGIBILITY REQUIREMENTS - The Surrey County AA Executive Committee at its meeting on July 21st discussed a proposal from Leighton Buzzard AC to allow first claim members of county affiliated clubs who did not have either a birth or residential qualification to compete in that county's championships. After considerable discussion, the executive committee voted unanimously against any rule change. Women 3000m - Claudia Lance Jones (Guildford & Godalming AC); Women 100m Hurdles - Pippa Earley (Kingston AC & Polytechnic H) and Men 200m - Chad Miller (Hercules Wimbledon AC). Chad Miller wins BRONZE MEDAL in the individual 200m followed by a SILVER MEDAL in the Mixed 4x200m Relay. Following collections at Croydon & Kingston a cheque for £110.50 has been received by the Lennox Children's Cancer Fund. LCCF have expressed their thanks to those who contributed to this generous donation. "The U13 Girls Surrey Team Selection has been made. I have taken into account the performances on July 1st, at the Lily B meeting, when making my selection, as I was there and saw the results. I appreciate the Surrey Rankings are not yet updated to show this, as the Power of 10 are not yet showing them. I have sent e-mails to parents of the selected athletes, if you have not received an e-mail please let me know. I will forward the Timetable when I have it. Any athlete who has an 800m performance under 2:36 for 800m can come on the day and do the non-scoring event, Anyone who has a 100m time of 14.0s or under can come and do the non-scoring 100m. Pease let me know if you wish to do so." Terry Letheby, the Surrey Under-13 Boys Team Manager, wishes to take account of Sunday's Ebbisham League fixture. The Division 2 results have been published but not Division 1. Selection Criteria for Surrey Inter-County Teams. 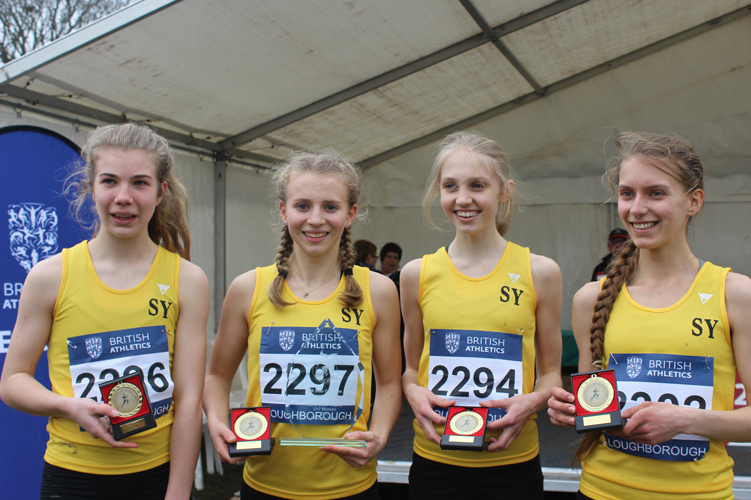 U13 Inter-Counties Meeting website (for previous results). NEW SURREY RECORD FOR U20 MEN'S 110M HURDLES - Competing at the Belfast International Meeting on 5th July Robert Sakala (Croydon Harriers) was timed at 13.60/+1.6. This was an improvement on the previous record of 13.66 which he set in 2016. Robert hopes that this will be sufficient to persuade the selectors to include him in the "2nd pick" for the GB & NI team for the European Junior Championships as their standard for the event is 13.75. Surrey Under-20 Men Records. Surrey County qualified athletes gained 26 medals in individual events including 14 Gold medals. Most were representing Surrey Schools followed by London Schools and one from Somerset Schools. Surrey County qualified medal winners. NOTE. Results now include full series data for field events. The team scores have been amended - these do not affect any team positions. In the Senior Women's 4kg Hammer Pippa Wingate's winning throw of 59.76m was a new Surrey County Record. The previous record of 59.14m was set by Pippa in 2016. Surrey Senior Women Records. Morgan Lake (Windsor, Slough, Eton & Hounslow) set a new Surrey Senior record when she won the Womens High Jump title with her clearance at 1.96m. This was an improvement on the previous record of 1.94m which was held jointly by Debbie Marti (Bromley Ladies) twice in 1996 and by Morgan once in 2014 and once in 2017. Surrey Senior Women Records. Morgan's victory and James Dasaolu's 2nd place in 100m means that they have gained selection for the World Championships to be held in London in August. Jade Lally's victory in the Discus and Adelle Tracey's 2nd place in the 800m mean that they should be included in the First Round of selections for the World Championships. Romell Glave (Croydon H) won both the 100m & 200m Under-20 Men titles. In the final of the 100m his time of 10.21/+1.0 was a new Surrey Under-20 record. The previous record of 10.25 was set by Jason Livingston (Croydon H) in the 1990 World Junior Championships held in Plovdiv, Bulgaria. Surrey Under-20 Men Records. Pippa Earley (Kingston AC & Polytechnic H) won the Under-18 Women 100m Hurdles in 13.61/-0.5 which is a new Surrey Under-17 record. As this event (100m Hurdles @ 76.2cm) is rarely run we have not, until now, shown it as a County Record. We think that the progression in this event goes from 13.82 by Claire St. John (Epsom & Ewell) in 1979; then 13.71 by Shirin Irving (Croydon H) in 2013; then 13.66 by Pippa in May this year. Surrey Under-17 Women Records. Morgan Lake (Windsor, Slough, Eton & Hounslow) equalled the Surrey Senior record when she won the Under-23 Women High Jump title with her clearance at 1.94m. There had been 3 previous clearances at this height - 2 by Debbie Marti (Bromley Ladies) both in 1996 and one by Morgan in 2014. Surrey Senior Women Records. Surrey athletes gained 7 Gold, 3 Silver and 3 Bronze medals in these championships. Many of these will be hoping to have been recognised by the Selectors for the forthcoming World Youth Championships (12th-16th July, Nairobi, Kenya); European U23 Championships (13th-16th July, Bydgoszcz, Poland); European U20 Championships (20th-23rd July, Grosseto, Italy) and Commonwealth Youth Games (18th-23rd July, Bahamas). Surrey medal winners. SURREY 10 MILE ROAD CHAMPIONSHIPS, DORKING, 4TH JUNE 2017 - RESULTS. Men 100m & 4x100m - Harry Aikines-Aryeetey (Sutton & District) 100m: 1st 10.21/-0.7; 1h1 10.33/+0.9. Ran 4th leg in relay for team which finished 1st in a Championship Record of 38.08. Men 400m - Dwayne Cowan (Hercules Wimbledon AC) 1st 45.46; 1h1 46.06 Q. Women 400m - Mary Iheke (Enfield & Haringey) 6th 52.60; 5h2 52.92 q. Women 800m - Katie Snowden (Herne Hill) 9th 2:05.19. Women High Jump - Morgan Lake (Windsor SEH) =7th 1.85m. Women Discus - Jade Lally (Shaftesbury Barnet) 10th 54.01m. SURREY ROAD LEAGUE 2017 - Team & Individual scores are available for the first three events. SURREY COUNTY TRACK & FIELD CHAMPIONSHIPS, KINGSMEADOW, 13TH/14TH MAY 2017 - RESULTS. All performances have been added to athlete profiles and have updated the rankings where appropriate. All the data from the field events has now been added so that you view the details of every jump and throw by clicking on "Result Card" for each event. Mike Fleet has supplied a set of 42 photos taken at the Championships. SURREY HALF MARATHON CHAMPIONSHIPS, RICHMOND, 30TH APRIL 2017 - RESULTS. NEW SURREY RECORD FOR U20 MEN'S DECATHLON - Competing in the Somerset Schools Combined Events Championships at Street, Somerset on 29th/30th April Sam Talbot (Exeter Harriers) scored 7377 points for the U20M Decathlon. This was the best score by a Surrey athlete for a Decathlon with Under-20 events and is the 5th best performance on the UK all-time lists. His performances in each event were: 100m 10.97/+1.1, LJ 7.19m/+1.8, 6kg SP 12.92m, HJ 1.96m, 400m 49.89, 110m Hurdles (0.991m) 14.36/-2.9, 1.75kg DT 35.83m, PV 4.10m, 800g JT 49.87m, 1500m 4:43.12. Surrey Under-20 Men Records. NEW SURREY RECORD FOR SENIOR WOMEN'S 3000M STEEPLECHASE - Competing in the Payton Jordan Invitational at Palo Alto, California, USA on 5th May Rosie Clarke (Epsom & Ewell Harriers) was timed at 9:36.75 when winning the 3000m Steeplechase. This was an improvement of more than 15 seconds on the previous record of 9:51.97 which she set at the London Olympic Stadium in July 2016. Surrey Senior Women Records. SOPHIE COWPER WINS ENGLAND 5K ROAD TITLE - Sophie Cowper (Rotherham H & AC) won the inaugral England 5k Championship which was held at Kingsley, Cheshire on Friday, 28th April 2017. SOPHIE COWPER SELECTED FOR ENGLAND - Sophie Cowper (Rotherham H & AC) has been selected to represent England in the Great Birmingham 10k on 30th April 2017. Despite now living in the North of England Sophie has retained her Surrey qualification and was a member of the winning Surrey Senior Women's team in the recent CAU Inter-County Cross-Country Championships. Furthermore, she has also volunteered to maintain the Surrey Track & Field Rankings for the Under-13 and Under-15 Girls for 2017. Sophie finished in 7th position. FAST 100M BY HARRY AIKINES-ARYEETEY - Competing in the Pure Athletics Spring Invitational at Clermont, Florida USA on 15th April Harry A-A was timed at 9.90 over 100m which is faster than the 9.91/+1.1 County record set by James Dasaolu in 2013. Unfortunately there was a following wind of 4.4m/s which means that it is not valid for record purposes. Surrey Senior Men Records. Senior Women: 1st Penelope Cummings (HHH) 59:24.0; 2nd Fiona Bishop (Woking) 68:58.9. Senior Men: 1st Mick Harran (HHH) 69:40.3; 2nd David Delaney (Surrey WC) 77:58.9. SURREY COUNTY ADO - Surrey Athletics are pleased to announce the appointment of Jake Waldron as the new County Development Officer. Jake will begin his new role on 2nd May 2017, and the role will include the creation of a county development plan, implement a coach education programme which will benefit Coaches, Clubs and Athletes, support coaching pathways that improve levels of athlete performance, build strong links with Surrey and London Schools Athletic Associations, and organise County Squad days. Further announcements will be made nearer Jake's starting date when contact details will be given. SURREY TRACK & FIELD RANKINGS 2017 - We are aiming to start publishing this years rankings in late-April (ie. after the first round of YDL and Southern League fixtures). We wish to thank those who have responded to the request for volunteers. Currently we have 2 new people who will cover the Under-17 Women, Under-15 Girls & Under-13 Girls. If you would be prepared to take on one or more of the male age groups then please contact Keith Burchell. SURREY COUNTY DISABILITY CHAMPIONSHIPS, 1ST/2ND APRIL 2017 - RESULTS. SURREY COUNTY AA AGM, 7:15PM, THE INSTITUTE, HIGH STREET, LEATHERHEAD, 31 MARCH 2017 - Sue & Peter Shilling were elected as joint Presidents. Lynne Reed was elected as Hon. Secretary. Junior Boys: 4th Harley Norman (Surrey); 5th Jaden Kennedy (London). Inter Girls: 2nd Claudia Lance Jones (Surrey); 3rd Charlotte Alexander (Surrey). Senior Girls: 3rd Julia Tomczak (London), 6th Niamh Brown (Surrey). ED WHITLOCK 1931 - 2017 - An obituary for Ed Whitlock who died on 13th March 2017 was published in The Times on 16th March 2017. It mentions that he was the first person over 70 to finish a marathon in under 3 hours when at the age of 72 he ran 2hrs 59mins 9secs; a time he improved a year later to 2hrs 54mins 49secs. In October 2016 at the age of 85 he ran the Toronto Waterfront Marathon in 3hrs 56min 33secs! He was born in South London and, although our records for the immediate post-war years are limited, they show that he finished 4th in the 1948 Surrey Youths Cross-Country Championship representing Surbiton Grammar School. By 1949 he had joined Walton AC and he finished 2nd in the Surrey Junior Mens One Mile championship and then in 1951 he was 7th in the Surrey Junior Mens Cross-Country Championship. In 1952 he emigrated to Canada where his athletics career ceased until he took it up again in 1975 when his 14-year old son wanted to attempt a marathon. Subsequently Ed set many age group records from the Mile to the Marathon and was the World Masters Champion for 1500m in 1979. His last race was in December 2016 when he came back to London to run in a cross-country event that he had previously won as a schoolboy. Profile. EA U17/U15 INDOOR COMBINED EVENTS, EIS, SHEFFIELD, 11/12TH MARCH 2017 - Pippa Earley (Kingston AC & Polytechnic H) set a new UK Indoor Record for the U17 Womens Pentathlon with her winning total of 3952 points. This is her second UK record this winter having previously broken the 60m Hurdles record at the Surrey Championships in February. Surrey Medal Winners. CAU INTER-COUNTY CROSS-COUNTRY CHAMPIONSHIPS, PRESTWOLD HALL, LEICESTERSHIRE, 11TH MARCH 2017 - RESULTS. In the team placings - Under-13 Boys, Under-17 Women & Senior Women were FIRST and the Senior Men were 2nd. The Under-13 Girls, Under-15 Girls, Under-15 Boys & Under-20 Women were 4th. Individual victories for Jaden Kennedy (U13B) & Claudia Lance Jones (U17W). Alex Brown was 2nd in the U17W. Andy Maud was 3rd in the SM. Ethan Scott (U13B) & Julia Tomczak (U17W) were 4th. Phoebe Law (SW) & Phil Wicks (SM) were 5th. of Claudia Lance Jones, Alexandra Brown, Julia Tomczak & Katie Hopkins. FRIDAY, 3RD MARCH - Morgan Lake qualified for the Final of the High Jump by clearing 1.90m. SATURDAY, 4TH MARCH - Morgan Lake finished 8th in the High Jump Final with a clearance of 1.85m. Theo Etienne finished 5th in the 60m Final with a time of 6.67. Previously he had won Heat 3 with a time of 6.62 followed by a victory in the second semi-final with a time of 6.59. Well done to absolutely everyone involved especially the team managers Laura, Graham, Fran and Natalie (plus Patricia who was there to assist with kit etc). Full info results to follow on website when available. Two teams may be more (once top scorers calculated from all regionals) through to the National Finals at The City of Manchester Stadium on April 22nd/23rd. OLIVE LONG - We regret to report the passing of Olive Long over the last weekend in February. She was active as a Timekeeper, alongside husband Bill. The funeral will be at Randall's Park, Leatherhead KT21 2DA on Wednesday 29th March at 11.45 followed by drinks and a buffet lunch at The Woodman, Ashtead. Please contact Martin 01737 352507 or futonboylong@aol.com to assist with catering numbers. NEW SURREY MARATHON RECORD FOR LILY PARTRIDGE - Running in the Seville Marathon on 17th February 2017 Lily Partridge's time of 2:32:10 beat the previous best time of 2:33:07 set by Nicole McCracken in the 1990 London Marathon. Surrey Road Best Performances. We congratulate John Beer on celebrating his 90th birthday. John has been a member of Dorking St. Pauls AC and its successors and represented them as a member of the Surrey County Athletic Association Executive Committee for many years and was the Associaion's representative to the Surrey County Playing Fields Association. UK INDOOR COMBINED EVENTS, EIS, SHEFFIELD, 11/12TH FEBRARY 2017 - Congratulations to Jade Ive (Pole Vault) and Morgan Lake (High Jump) for their Gold Medals. Jade's clearance at 4.35m was a new Surrey Indoor Record (previous best was 4.26m by Ellie Spain in 2007). Surrey Medal Winners. PAM DAVIES - We regret to report the passing of former Surrey president Pam Davies, winner of the English women’s cross country title a record-equalling four successive times. She died in a North London hospital after a short illness, aged 82. She took up athletics in 1953 when she was a student at Leicester University after she discovered there were races further than 100 yards. She began at 880 yards and was the Women’s AAA national one mile champion in 1963. After finishing runner-up in the English women’s cross country championship in 1964, she won the event in 1965, 1966, 1967 and 1968, only the second runner to win the title four consecutive occasions. Diane Leather (1953 to 1956) was the first runner to achieve the feat. She also represented England three times in the international championship. Although she achieved further success on the track she admitted cross country running was her favourite event. She was a regular competitor in the Surrey Championships between 1961 and 1973 winning the one mile title four times in 1962, 1963, 1964 and 1968 and the county senior women's cross country title in 1960, 1962, 1963, 1964, 1965,1966 and 1967. She and her late husband John were the 20th century Bow Street runners as they frequently trained from their home in Bow Street where they had two sons. She was also a full-time teacher as head of science at a South London school. She lived the last few years of her life at the Highbury development in North London to be near one of her sons. After retiring from competitive athletics in the 1980’s she continued to support the sport as a qualified official. She was elected Surrey president in 2001 and from 2002 to 2013 she was assistant secretary taking the minutes of executive committee meetings. Profile. 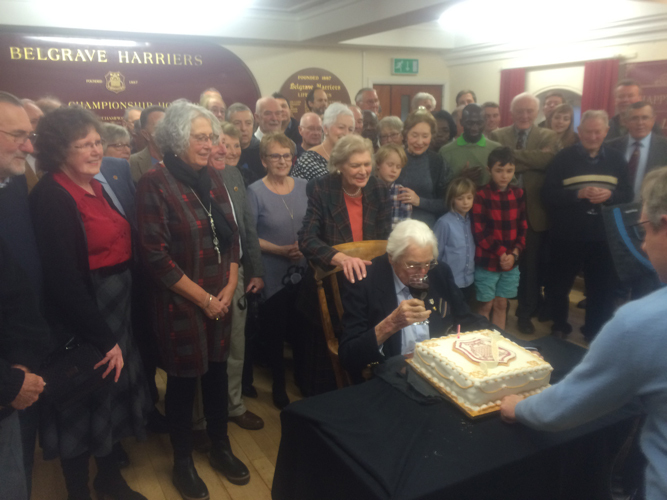 Belgrave Harriers celebrated Bill’s 100th birthday in style with a great party at Belgrave Hall on January 15th where Bill and his wife Sheena were the guests of honour. They were photographed in front of a 100th birthday cake and they were interviewed by TV and newspaper reporters. 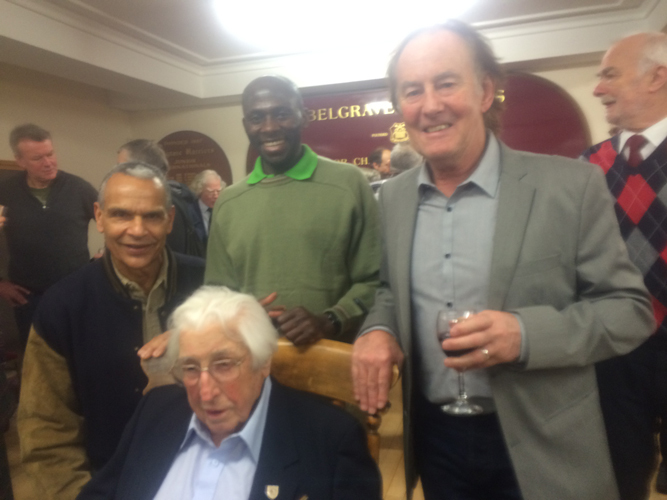 Among almost 100 guests were South of England president John Gebbels, Surrey president Pete Mulholland, Surrey chairman Tom Pollak and three other Belgrave Olympians Snowy Brooks, Pascar Owor (Uganda) and John Bicourt. There was a half-page report of the event in the Daily Mirror on January 16th and coverage of the celebrations on ITN London through January 16th. Bill with 3 other Olympians. L-R Snowy Brooks, Paskar Owor & John Bicourt. EA SENIOR / UNDER-20 INDOOR COMBINED EVENTS, EIS, SHEFFIELD, 7/8TH JANUARY 2017 - Congratulations to Dylan Carlsson-Smith (Shaftesbury Barnet) for his 3rd place in the U20M Heptathlon. SURREY COUNTY CROSS-COUNTRY CHAMPIONSHIPS, LLOYD PARK, CROYDON, 7TH JANUARY 2017 - RESULTS (including photos). Performances have been added to athlete profiles.